If you are interested in booking Waihōanga, please contact us and we will send you a custom quote. We try hard to keep our prices reasonable so that Waihōanga remains accessible to everyone – this includes small bookings who want indulgent catering and a room each, large groups of school-kids who want space to run, play and make a lot of noise, family parties, weddings, yoga retreats, silent meditation retreats, planning meetings, strategy workshops, writing retreats and book club getaways. Please contact us for a quote as prices do vary quite considerably depending on the experience you are coming here for. Linen and towels are included in the booking price. Discounts are available for community and school groups (see below). There is also a special Events Package for weddings and large family parties (see below). We have low season (June, July, August) and high season (September – May) rates. We also have a minimum booking price. We have a two-night minimum for weekends, and on public holidays you have to book the whole long weekend (eg Thursday evening – Monday for Easter). We ask guests to arrive anytime from 5pm, and leave by 2pm on the last day. We have an additional day rate if you’d like to book the lodge for longer on your day of arrival or departure. A cleaning fee is added to all bookings. Limited wifi is available throughout the lodge area and included in the full price option. Guests staying on a discounted package can still use wifi but pay per usage ($2/GB). By default, wifi is turned off when guests arrive as many groups visit Waihōanga explicitly to escape the wired-up world. 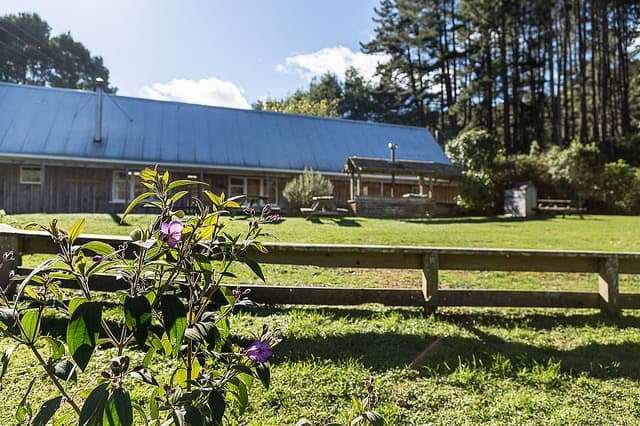 There are eight seperate sleeping rooms available for hire at Waihōanga – four in the main lodge, two small huts, and two private cabins. Between them, there are 38 beds (plus a camping field), many of which are in bunk beds. All bookings include the Waihōanga Lodge as well as Chicken and Rooster huts. The lodge has 26 beds across 4 bedrooms, 5 showers and 5 toilets, a lounge and a kitchen-dining room. Chicken and Rooster each have one bunk bed (ie, 2 beds) and are close to a seperate toilet. The full price for booking the Waihōanga Lodge (including Chicken and Rooster huts) is $45 + GST per person per night. The minimum booking cost is $600 per night in low season (June, July, August) and $800 per night in high season (September – May). Camping costs $30 + GST per adult, and accompanying children 12 and under are free (fair use applies). Day guests cost $25 + GST per person. The lodge can be hired for an additional half day for $400 + GST or for a day-only event for $600 + GST. A cleaning fee of $180 + GST is added to all bookings. Two additional private cabins are available for an extra cost. These include a sleeping/ living area but rely on the use of facilities at the lodge (cooking area and bathrooms). The yurt can also be hired for group use. Saddleback Cabin can sleep up to 4 people. This can be hired at an additional charge of $45 + GST per person per night, with a minimum hire fee of $120 + GST per night. Kāhu Cabin has a double bed plus 2 single sofa beds and can be hired for $150 + GST for up to two people and $25 +GST per additional person. The yurt is available for guests for single day hire at $150 + GST, or $200 + GST for a weekend. A reduced rate for longer periods can be negotiated. As an exciting new addition we are now offering Glamping – camping in style. These beautiful tents offer that “something special” to make your stay all the more memorable. We have four tents available, with the ability to accommodate up to 25 tents in conjunction with Nomadic Tents. Glamping is available for an additional $150.00 per glamping tent for up to 2 people. Any others wishing to be in the tent (up to 6 in total) are at the camping rate ($30.00 /p /n) and will need to provide their own mattress and bedding. We offer a community discount for not-for-profit groups by absorbing the cost of GST into our prices. (Ie, as an example, the base rate is reduced to $45 per person per night, inclusive of GST.) This is applicable for family parties, community groups and community-led wellness retreats. If you think you might be eligible for this, please tell us a bit more about your group at the time of booking. In some cases, these groups contribute back to Waihōanga in other ways, such as through sharing food, spreading the word with social media, sharing images for our website, or helping on the land. We also offer a schools discount of $30 +GST per person per night. The camping rate is $25 + GST per adult and $15 + GST per student per night. Minimum booking prices are $450 + GST (low season) and $675 + GST (high season) per night, respectively. Our Events Package, primarily for weddings and family parties, recognises that you often don’t know how many people will be coming and going throughout your time here, and that there are usually many more day guests than overnight guests. These events usually also have a higher impact on the property both in terms of vendors and visitors, and also cleaning. For the events package the (GST-inclusive) price is still $45 per person per night in the lodge, $30 per person for camping (accompanied children camping go free), but day guests are free. There’s a minimum booking of $1200 per night including 8 guests (low season), and $1650 per night including 18 guests (high season) and a cleaning fee of $250. A number of suppliers and schools are certified to run activities at the Waihōanga Ropes Course. For guests staying at the lodge, we can offer a special rate of $45 + GST (adults) and $35 + GST (students), with a minimum booking fee of $450 + GST. The same community discount as above is available. The minimum booking fee increases to $920 + GST for people not staying at the lodge. In order to confirm your booking, we require a deposit of the minimum daily rate for up to 3-day bookings (the deposit may be a percentage of the total for longer bookings). For weddings and large events a bond of $500.00 is payable 6 months in advance. Full payment is required one week in advance of the booking. If your numbers increase after that date, or you choose any additional services (such as the Ropes Course or internet usage), then we provide a final invoice with the amount owing one week after you have stayed. What’s GST got to do with it?